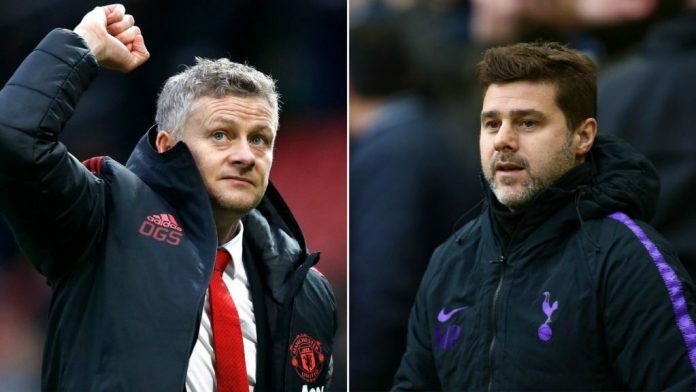 Mauricio Pochettino and Ole Gunnar Solskjaer go head to head as Tottenham host Manchester United in a super Sunday showdown at Wembley. Pochettino remains United’s number one target to become the club’s permanent manager this summer after Jose Mourinho’s dramatic sacking in December, though Solskjaer is certainly giving the Red Devils food for thought as caretaker manager. Club legend Solskjaer has brought the feel-good factor back to Old Trafford, playing attractive football and winning his first five games in charge – but they meet a Tottenham side of real style and substance as Spurs sit third in the Premier League table. While Ed Woodward may still see Pochettino as the coach to take the United hot-seat permanently, beating the Argentine at Wembley would do Solskjaer’s chances of landing the job no harm at all. Eric Dier is closing in on a timely return to fitness. Pochettino has demonstrated the strength in his squad with consecutive wins against Tranmere and Chelsea in the domestic cups but they have looked particularly short in central midfield, where Harry Winks and Moussa Sissoko have had only 18-year-old Oliver Skipp for cover during Dier’s absence. Mousa Dembele is back in training following an ankle injury but the Belgium international remains in talks over a move to China and is unlikely to play for the club again, while Victor Wanyama remains sidelined as he fights to recover from another long-term knee injury. The club hope the Kenyan will be able to return before the end of the month. Lucas Moura, who scored twice at Old Trafford, will be assessed ahead of the game after a knee injury sustained at Tranmere, while Jan Vertonghen will return to the squad after a thigh problem. Heun-min Son is almost certain to start given that this will be his final game before leaving for the Asian Cup with South Korea. Eric Bailly is suspended for United following his red card against Bournemouth. With Chris Smalling (ankle) unlikely to return and Marcos Rojo still out, that should ensure Victor Lindelof and Phil Jones continue at centre-back. Solskjaer could well play Ashley Young at right-back with Antonio Valencia failing to impress against Newcastle, while Anthony Martial may also have to settle for a bench role after underwhelming at St James’ Park – that could mean a start for Alexis Sanchez. Romelu Lukaku is pushing for a start after getting leaner and scoring three goals in as many games off the bench, but it’s most likely that he will be used as an impact sub after an hour. Check out Yobetit.com to find the latest match odds and place a bet. While it is still hard to judge the Red Devils despite their winning streak given the quality of the opposition, there is no doubt they are enjoying greater attacking freedom under the new regime. Having scored 16 goals in five matches under Solskjaer, they will certainly back themselves to trouble a defence that conceded three times against Wolves in the previous home game. However, they will not be so confident of keeping things tight in their own backline against Mauricio Pochettino’s team, who have hit the net 23 times in just the last six fixtures.